Extech General Tools & Instruments Co. This precision unit measures air flow volumes up to 2.5 million CFM (72,000 CMM) and features a hot wire sensor that handles even the lowest air speeds with ±3% accuracy. 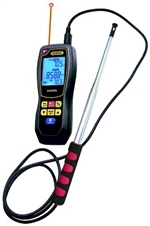 Includes 8:1 IR thermometer with laser pointer that measures: -25° to 999°F (-32° to 537°C). Allows precise capture and logging of up to 20,000 data points via the USB interface. 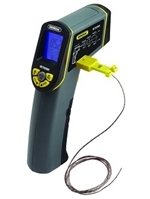 Ideal for measuring speed, volume and temperature of slow-moving air. The transfers are wireless, via a local WiFi hotspot without internet access generated by the iBorescope2. The PalmScope is more than just the smallest full-featured video inspection system available today. It is also built to survive in the harsh environments of plumbing and automotive maintenance and repair—not to mention any unusual situations a do-it-yourselfer might subject it to. The unit’s thermoplastic rubber (TPR) housing and integral LCD are certified “drop-proof” to a height of 1m (3.4 ft.). The system can be operated with one hand, leaving the other hand free to use tools. 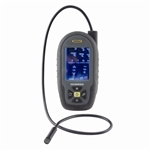 Ideal for accurately measuring any environment's temperature, relative humidity (RH), dew point, and other condensation parameters. 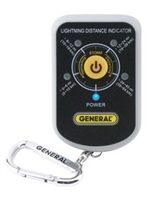 Ideal for early storm warnings, storm directions, and protection for any outdoor activity.